The following chart depicts sales and listing activity in the Southwest Florida MLS areas of the Naples, Bonita Springs, and Estero real estate markets. The snapshot shows, pending (sold), and new listings for the past 12-month period to date. Current market time is about 4.86 months. New listings are expected to increase in the December-February seasonal window. Naples, Fla. (October 17, 2014) - Limited inventory continues to be the story of the Naples area real estate market, according to the third quarter report released by the Naples Area Board of REALTORS® (NABOR®). Inventory of existing homes decreased 9 percent from 4,080 homes available in the 3rd quarter of 2013 to 3,702 homes in the 3rd quarter of 2014. This tight inventory affected sales activity as demonstrated by a 10 percent decrease in pending sales from 2,548 in 3rd quarter 2013 to 2,304 pending sales in 3rd quarter 2014; and an 11 percent decrease in closed sales from 2,339 in 3rd quarter 2013 to 2,093 closed sales in 3rd quarter 2014. Contrary to the reduction of pending and closed sales in the 3rd quarter of 2014, real estate agents across Collier County reported being very busy keeping up with the growing demand. 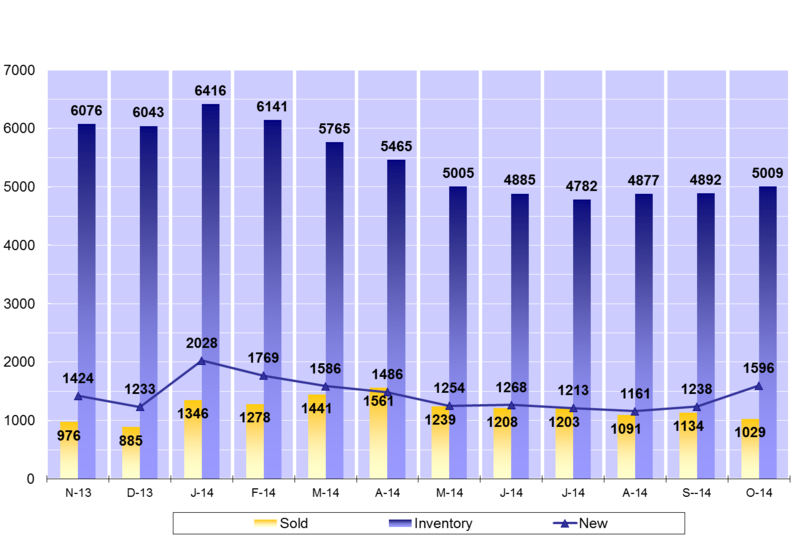 This anomaly, as confirmed by a panel of brokers analyzing the NABOR® 3rd Quarter 2014 Naples area market statistics, is likely a result of the market experiencing an influx of new home construction that, while not reported in the Southwest Florida MLS, has replenished the void resulting from a decreased inventory in the resale market. Pending sales of single family homes over $2 million increased 26 percent from 43 in 3rd quarter 2013 to 54 3rd quarter 2014. Pending sales of condominiums between $1 million and $2 million increased 29 percent from 38 in 3rd quarter 2013 to 49 in 3rd quarter 2014. Overall closed sales in the $300,000 to $500,000 category increased 13 percent from 398 in 3rd quarter 2013 to 451 in 3rd quarter 2014. Overall closed sales in the $1 million to $2 million category increased 14 percent from 91 in 3rd quarter 2013 to 104 in 3rd quarter 2014. Overall median closed price increased 13 percent from $234,000 in 3rd quarter 2013 to $265,000 in 3rd quarter 2014. Overall median home price of homes over $300,000 decreased 7 percent from $530,000 in 3rd quarter 2013 to $493,000 in 3rd quarter 2014. Overall inventory decreased 9 percent from 4,080 homes in 3rd quarter 2013 to 3,702 homes in the 3rd quarter of 2014. Overall inventory of single family homes in the $300,000 to $500,000 market increased 15 percent from 422 in 3rd quarter 2013 to 487 in 3rd quarter 2014. Overall pending sales increased 2 percent from 810 in September 2013 to 829 pending in September 2014. Overall closed sales decreased 3 percent from 9,919 in the 12-months ending September 2013 to 9,585 closed sales in the 12-months ending September 2014. Overall median closed price increased 14 percent from $230,000 in the 12-months ending September 2013 to $262,000 in the 12-months ending September 2014. Overall inventory decreased 9 percent from 4,080 in September 2013 to 3,702 in September 2014. Broker analysts agree that new construction within the last year is a welcome addition to the Collier County housing market. With guidance from a local REALTOR®, buyers can discover opportunities and ensure their sale or purchase is a success within both the new home and resale markets.